The thoughtless freedom, peaceful rest and eternal darkness is interrupted by the nagging sound of my alarm going off, like a nuisance purse dog with its small dog syndrome. I begin the stumble from my bedside toward the infernal racket as quickly as possible, shutting it down before it disrupts the rest of my household anymore than it already has. From there I continue toward the bathroom, where I decide its time to take a look at the time. Ergh, 445am, what am I doing? The answer to that very question perks me up immediately and within a few minutes I finish checking that I am packed, eat enough to fuel myself for the beginning of the day ahead, and eagerly await my pickup as the sun slowly begins to awaken the sky from its darkness. 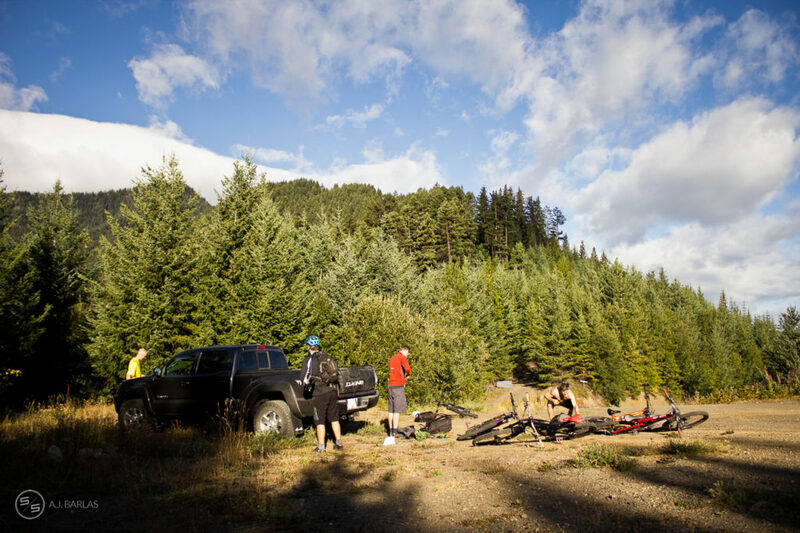 September is the beginning of the end for many mountain bikers across North America, but it’s also some of the best riding of the season. Temperatures cool a little, but often there is still plenty of sun. Kids are normally back in school making it quieter around town. Then there’s the extra moisture which results in the dirt taking on the consistency often referred to as ‘hero dirt’. 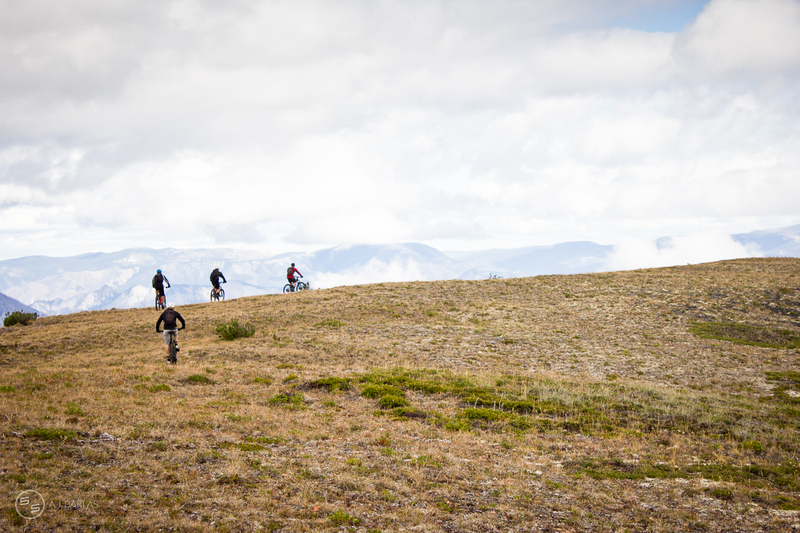 Personally, the most exciting part of riding in September is its prime time for expedition days, with plenty of self supported backcountry travel to look forward too. Come this time the snow-line has most likely receded enough to support these monster alpine days, we’re more capable/fitter, and a whole team of like-minded individuals are open and available for it—the stars align. The group that I speak of wasted no time this year, hitting a big mission on the first day of the month. While many were fighting lift lines or lounging around barbecues, this small clan left home at 530am and headed north in search of something unique. 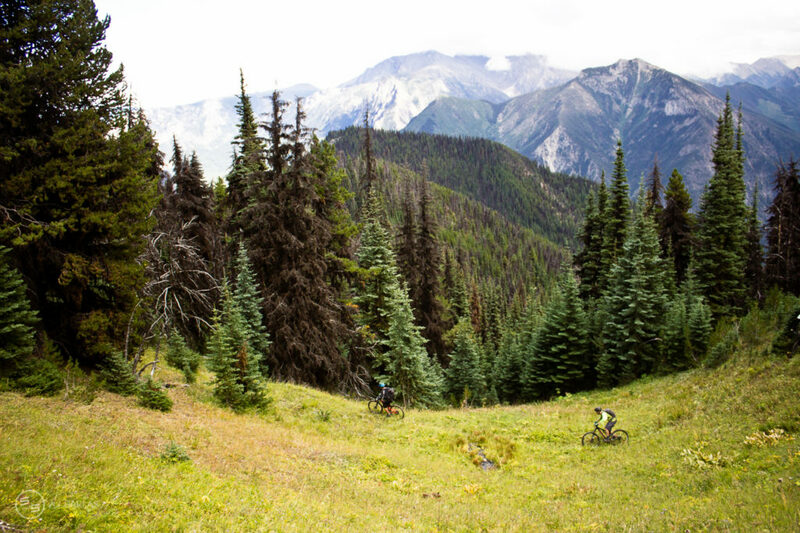 Mildly weary of the regular Chilcotin trips after years of travel to and fro, in addition to copious amounts of Facebook updates from other similarly likeminded souls, we ventured out for something a little different. Not all of us live in the same location and one integral member of the group was lucky enough to sleep until 730—nevertheless, he had less shut-eye than the rest thanks to reasons we won’t delve into. Now the truck was full, but with the perfect amount of people for the territory. Two’s company and three’s a crowd, but more comforting for this Aussie was the group being large enough that any of the larger, shaggy wildlife would no doubt hear us well ahead of our arrival. It’s hard to travel quietly in a pack of two or three, each dragging bikes and gear along the way, but a pack of five should be even better. What we discovered was just what the doctor ordered. Not too dissimilar to the Chilcotin’s, we still found mass ridge-lines and moonscape environments, but there was enough of a difference to make it stunning in its own right. Large Colorado-esque rock walls full of features overbore the group, putting us right in our place—it’s humbling when nature makes you feel small and insignificant, but nestles you in at the same time. We ventured to the uppermost point possible without climbing gear, against strong gusts of wind that seemed to want nothing more than keep us away from our goal. It was here that the group found the ground-cover to be completely different to anything experienced elsewhere on similar trips. There was not a lick of soil up there and instead, we were moving across black, fist sized rocks covered in a yellow algae, that were wedged together perfectly—as if mother nature had the most successful game of Tetris imaginable! Riding across this was straight-forward enough, so long as the howling gusts of wind didn’t hit too hard in an attempt to blow us off the ridge, and consequently, the mountain. The rock rumbled away underneath us, imitating the gobble of a bush turkey on the run, but didn’t last too long. After a couple hundred metres of descending we arrived on terrain that was loose and sandy. 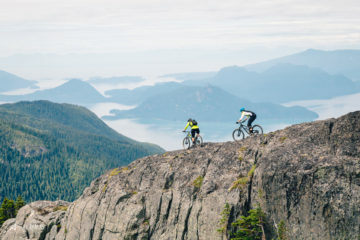 It was at this point that the group proceeded to imitate the likes of James Doerfling or Graham Aggassiz—and completely fail. Riders went over the bars, while others felt like complete gorbs as they tried to figure out what was happening beneath them. 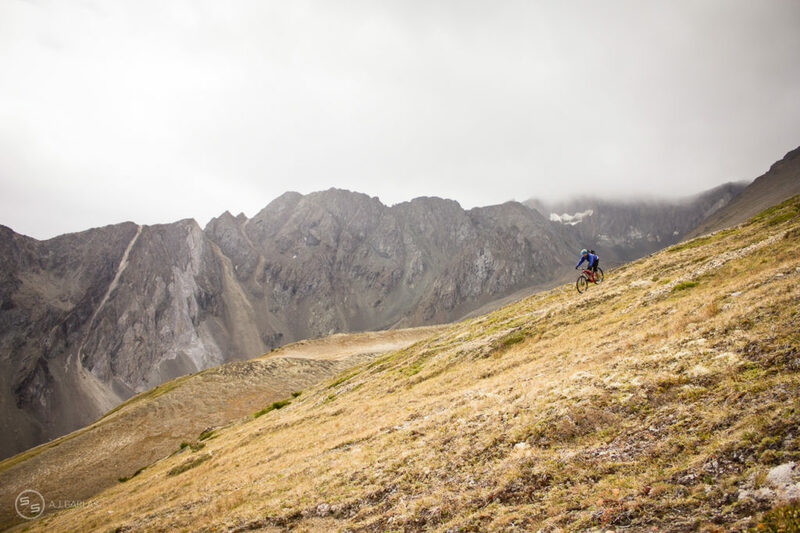 If there was the slightest lack of respect for riders that ski big mountain lines on their bikes, there wasn’t now. Beneath this point we hit the meadows, ripping turns through the deep, bumpy alpine grasses before arriving at our low-point, regrouping, and beginning the journey back along the ridge-lines. Perhaps the most surprising, and rewarding part of the trip was the final descent. A descent that while making our way up, seemed too steep, narrow and loose to really enjoy coming back down. How wrong we were! Once heading down it was all hoots and hollers, sliding on-the-edge-of-dying for 6km and 600m of vertical. It wasn’t all smooth sailing; however, with one of the tricky s-bends on the descent catching a couple of us out. Most made it through unscathed but one wasn’t so lucky and was unfortunate enough to slide off the trail and begin falling down the (very) steep mountainside. Laughing it off, it wasn’t until later that hindsight made clear that if it weren’t thanks to a luckily timed, panic ridden fist-full of rear brake getting the bike perpendicular to the hillside, and a pedal large enough to gouge into the mountain, life could be very different. Nevertheless, the spills did little to dampen the rest of the ride. 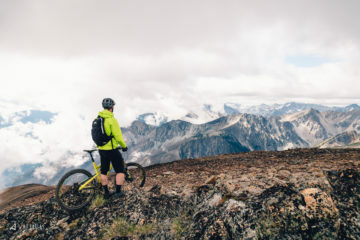 In fact, they seemed to spur everyone on more, as the thrill of the riding being consumed soon turned into an apparent “if that’s the worst that can happen” attitude, resulting in some loose examples of bike handling throughout the remainder of the trail. Good, f’n, times. September started out just how we wanted with the ride on the first now only irritating the incessant itch for more. With the very possible reality of only a few more weeks for these sort of adventures, we have to get it in while we can, and although September is the best time of year for these sort of trips, it also isn’t unheard of for old man winter to arrive early and drown our spirits. Question is, where next?